There are two levels of classes. 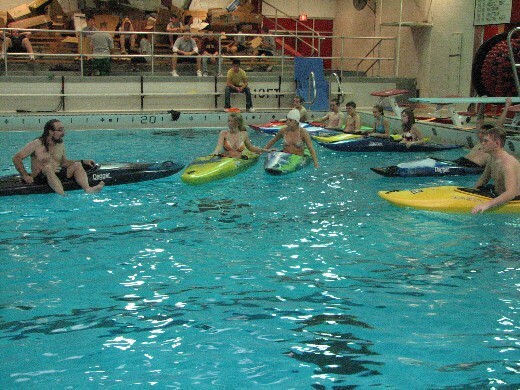 Packed with the fundamentals, this class will teach kids to kayak with fun games such as water polo and Frisbee. Kids will learn all the essential kayaking techniques and safety rules and regulations. Personal floatation devices will be made available for the kayaker if needed. This program is designed to wet your appetite for kayaking. Learn the basics from completing a wet exit to proper paddling techniques. You will even get a chance to practice the Eskimo Roll. This is a great class for a group that would like to try kayaking but does not have a lot of time. Are you a beginner wanting to learn kayaking or do you need to brush up on your paddling skills? Indoor Summits has what you need. Our staff has years of kayaking and guiding experience to help you with your stroke or rolls.